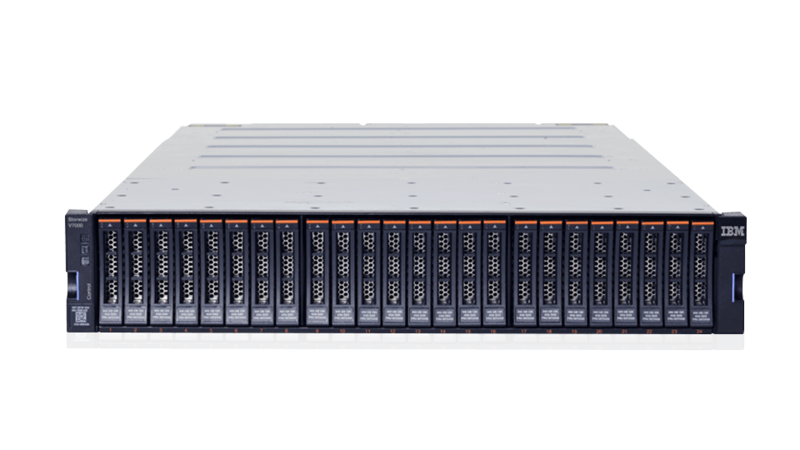 IBM® Storwize® V7000F is an all-flash, highly scalable, storage system that provides high performance and advanced management functions. Built with IBM Spectrum Virtualize™ software, this solution consolidates workloads into a single system. You gain ease of management, reduced costs, superior performance and high availability. Hardware-acceleration for data reduction delivers faster performance while reducing your acquisition and operational expenses. Storwize V7000F delivers all the features and capabilities demanded in the largest enterprise environments, at a cost-effective price. Leverage IBM Spectrum Virtualize to extend heterogeneous data services to more than 440 storage systems. Extend the life of your existing assets and manage your infrastructure using a single system. All-flash performance with NVMe over Fabrics (NvMe-oF) improves core application response times to help you speed insights, accelerate innovation and gain competitive advantage. High-density expansion enclosures easily scale into the petabyte range. Four-way clustering enables growth from smaller configurations. Storwize V7000F gives you the full power of storage encryption inside the hardware arrays and in the IBM Spectrum Virtualize management layer.